According to studies created by the U.S. Environmental Protection Agency, exposure to air pollutants indoors can be 100 times higher than outdoors. Frequent dusting and vacuuming can help reduce the amount of dust and dust mites present in your home. However, not all airborne particles can be eliminated. Filtration devices can help eliminate particles that are too small to be picked up by a vacuum. Some filtration devices include UV light units, air filters, energy recovery ventilators (ERVs), heat recovery ventilators (HRVs) and electronic air cleaners. Our company can provide a free home assessment which can help you decide which indoor air improvement products are right for you. Call 1 877 678-2703 to get your free assessment started. 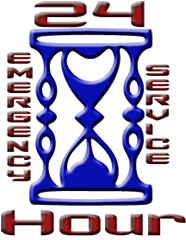 Maintenance and service play a key role in the lifecycle of a heating or air conditioning system. If all recommended maintenance and service actions are taken, an air conditioner can last 15 to 20 years and a gas furnace 20 to 25 years. A heat pump can act like an air conditioner, transferring heat from inside to out, or like a heater as it transfers exterior heat to the interior. A winter day with a temperature of -10°C still produces enough heat to warm a space when the air is transferred by heat pump. How do I choose the right humidifer? Consider the size of the residence. A humidifier's capacity, or the amount of moisture it can dispense in a given time, should match your particular household's needs. The capacity is measured as gallons per day of operation. One method that is used to determine the correct-sized humidifier for your home is by multiplying the total floor area in by the ceiling height. We can provide you with this information and additional information to help you figure out which type of humidifier will best suit you and your family’s comfort needs. Consider the initial cost. Consider not only the purchase price of the humidifier, but also operating and maintenance costs. Some models consume more energy than others, so choosing a model that is right for your home and budget is extremely important. What are my benefits of having a central humidifier? During the heating season, people are confined indoors with unusually dry air for many months each year. Humidifiers help to keep comfortable levels of moisture, and properly maintained levels of humidity are beneficial for your respiratory system. Whole-house humidifiers work like old-fashioned room humidifiers. They add moisture into the air, making harsh, dry air much easier to breathe. And whole-house humidifiers automatically humidify the entire home, no more lugging a humidifier from room to room, spilling water on the floor as you go. What quantity of water does my humidifier use? Depending on the product you choose and the size of your home, a humidifier may use from 1.5 to 12 gallons per day when the furnace is operating. The amount of water used is enough to raise the humidity to your desired level, but not enough to notice a difference on your water bill. A dehumidifier is a great way to regulate the humidity in your home. This appliance works by filtering the air in your home and extracting the water. The water then goes into a tank that you can use to water your flowers or garden. While it may seem like a good idea to shut all of the windows when it is hot out, you need to let air circulate through your home or the humidity levels will rise. When the air is stagnant the humidity in the house will actually feel worse because there is no release of the air. What ways are available to better control my home energy cost? One step to control energy costs is to schedule annual maintenance to ensure your furnace and air conditioner is running properly and efficiently. Operating dirty heating or cooling equipment can result in unnecessary loss of efficiency and may even damage the equipment. If you are in the market for a new home comfort system, consider purchasing a high-efficiency system. They are designed to help reduce your energy costs as well as help conserve natural resources. When selecting a new home comfort system, pay close attention to the SEER rating of the air conditioner and the AFUE of the furnace. The higher the SEER or AFUE, the higher the efficiency and savings. Zoning can drastically lower your heating costs. Zoning divides your home into separate comfort areas, which are heated or cooled based on the occupancy of the rooms. That means a zoning system allows each room in your home to potentially have its own temperature setting. With a zoning system, you no longer pay to heat or cool the space of your home that are rarely used, and your family gets the exact temperature you want in highly occupied rooms. Programmable thermostats can make a huge difference in energy consumption. Since you can proactively set a schedule for the days and times that the home is occupied, these thermostats are able to deliver exact comfort, efficiency and energy savings. For example, if you're going to be away, you can set the whole house at an energy-saving temperature to avoid heating or cooling an empty house and conserving energy in the process. Carbon monoxide may be an invisible threat to health and safety in the home. Though more commonly connected to fireplaces and vehicle emissions, carbon monoxide poisoning may be found in any home unless certain precautions are taken. What are the human effects of carbon monoxide (CO)? When entering the body, carbon monoxide mixes with the red blood cells in the blood and displaces the oxygen our body needs to survive. Carbon monoxide combines with the red blood cells over 200 times more easier than oxygen and creates a condition known as carboxyhemoglobin saturation. Carbon monoxide, instead of oxygen, then gets carried to the vital organs through the bloodstream. Our organ tissues require oxygen, without it our body starts to asphyxiate or suffocate. It takes the body a much longer time to eliminate carbon monoxide, than how it is absorbed very quickly by the body. Indoor Air Quality is a term used to denote the level or amount of air pollution that exists inside a house or building, particularly occupied areas or rooms. Exposure to air pollutants can be up to 100 times higher indoors than outdoors, and the American Lung Association estimates that most people spend 90% of their time indoors. So the IAQ level and IAQ products that help to improve air quality and eliminate indoor air pollution have become an important concern for many families, especially those suffering from allergies and respiratory issues. In some cases, freezing up is caused by a leak in the refrigerant lines. Weak solder joints, friction from piping rubbing or vibrating against an object, leaking valves or loose fittings can cause leaks. The length of time your system has been installed and the type and location of the leak will determine whether to have the system repaired or replaced. Over time, the evaporator coil will become dirty. On these occasions, the results are similar to those of having a dirty filter. Progressively you will lose airflow, slowly enough that you probably would not realize it until it freezes up or is not cooling adequately. You will need to Call us at 1 877 678-2703 to fix the problem. A blower motor operating at the wrong speed or not running at all can cause freezing. It can also be sporadic, starting at full speed and slowing down after it heats up. Or a relay could cause it to start one time and not the next. Either way, you will need to Call us at 1 877 678-2703 to fix the problem. 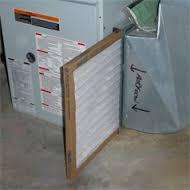 Should you learn that your system was freezing due to a dirty air filter, after replacing or cleaning the filter, you can hasten the thawing process by turning the system off and then turning on only the fan. If you have a heat pump system, you can try turning the system to heating mode until the ice has melted. After the ice has melted, turn the system settings back to normal. If the system refreezes, Call us at 1 877 678-2703 to solve the problem. HVAC systems are complicated networks of machinery that should be serviced by a certified professional. However, if your HVAC system seems to be malfunctioning, you can try a few basic steps, which may correct your problem, prior to calling a service professional. If you do not feel comfortable performing any of these task, do not hesitate to Call us at 1 877 678-2703. - Disconnect and reconnect your indoor and outdoor switches. - Make sure your circuit breakers are in the ON position. - Make sure your filters are clean. - Check the settings on your thermostat. - Make sure the system switch is on the appropriate COOL or HEAT setting. Your system can actually be located in several different places. A system with up-flow application might be located in the basement, while a system with a horizontal application may be found in your attic. A self-contained, or single package unit could be located outside on a slab or on the roof. Your garage could house an up-flow, down-flow or horizontal application system. Heating and Air Conditioning equipment, no matter what kind you have, should be inspected, cleaned, and serviced at least once a year. The best scenario is to have the heating system checked in the Fall and the air conditioning checked in the Spring. Oil-fired equipment should definitely be cleaned and serviced annually; at the beginning of each heating season. Many people have allergic reactions to pollen, bacteria, dust mites, and animal dander. Alergies including hayfever and asthma which affect 41 million of North Americans or about one out of six people. Why have your Ducts Professionally Cleaned? Contaminants in your Heating Ventilation Air Conditioning (HVAC) system can aggravate asthma and allergies. Our Duct Cleaning process can help eliminate bacteria and fungus to improve the air quality in your home. Cleaning your air ducts can protect everyone in your home from breathing contaminated air. Cleaning your air duct system helps your HVAC system run more efficiently, resulting in less run time and lower heating and cooling bills. Cleaning your air duct system can also extend the life of your heating and air conditioning equipment. Your new home may not be as clean as you think. During construction, your air duct system is open allowing wood shavings, drywall dust, dirt, trash, and carpet fibers to settle or be swept into your system. Cleaning your air duct system is the only way to thoroughly remove these contaminates. A system that is too large will cool or heat your house quickly, but you may not feel comfortable. That's because it will satisfy the thermostat before it can adequately remove sufficient moisture from the air during the cooling mode, leaving you feeling sticky and humid. This could even lead to moisture and mold problems. And, the stress of short-cycling (too many starts and stops) will shorten the life of your equipment and increase your heating and cooling bills. But a correctly sized system isn't just based on the size of the structure. Many factors go into determining the size of the system. Including type of house and walls, type and size of windows, insulation, basement and attic conditions, house orientation, and so on. A free in home assessment must be done to get detailed measurements notes Call us at 1 877 678-2703. R-22 is the common name for hydro-chlorofluorocarbon (HCFC). 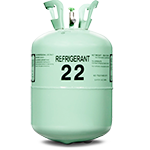 HVAC manufacturers have used R-22 as a for over 40 years, but studies in the past decade have shown that HCFCs contain chlorine, an ozone-depleting agent. The Clean Air Act had agreed to reduce HCFC consumption and production between 2010 and 2015 from 65% to 75% which restricts by approximately 20% the amount of HCFCs that would have been available between that time period. Well first, the price of R-22 refrigerant is skyrocketing as we speak. It has already doubled since this time last year and is expected to triple in the next few years. In turn, this could very well drive up the cost of maintaining and servicing your air conditioner or heat pump. Secondly, the supply of R-22 refrigerant is already limited, and as the phase out continues and prices rise, you can expect availability to fall. Eventually, contractors may not be able to guarantee to always have R-22 on hand. If you have an existing R-22 heat pump or air conditioning system, you do not have to rush out and buy a new R-410A system right away. You can continue using it, but at the very least, you should make sure to properly maintain your unit. Regular servicing minimizes potential environmental damage along with the higher maintenance costs due to mechanical breakdowns or refrigerant leaks. But for our customers who have R-22 systems over 10 years old, you may want to consider replacing now rather than later. 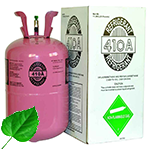 R-410A is the common name for hydro-fluorocarbon (HFC) that is being used as a refrigerant in the HVAC industry. Homeowners and business owners can now purchase an Air Conditioner or Heat Pump for their home or office that uses R-410A because it is more environmentally friendly than R-22 and is now the replacement for R-22 by HVAC manufacturers. By selecting R-410A, you eliminate the possibility that refrigerant leaking from your system might contribute to the hole in the ozone layer, and you'll also be investing in a comfort system that will last you for many years to come. Do I have or need an appliance Air filter? It's the single, most important thing you can do for your central heating and air conditioning system! Different systems have different filter locations. If you don't know where your filter is located, now would be a good time to learn! 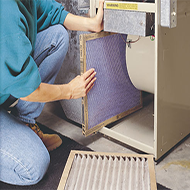 Usually, there is a removable filter access door in the return air duct next to the furnace or indoor unit. This can be in a basement, crawl-space, utility closet, garage, or attic. Keep in mind, many air filters are directional - the air is meant to flow through the filter in one direction only. Look for an arrow or airflow symbol indicating direction. The arrow should point towards the furnace or air handler. If your filter does not have any arrows, see if one side of the filter looks rougher than the other side; that would be the side to collect the dust, so the other side would face the equipment. We suggest checking filters monthly. If you have a disposable type filter, (these usually have a cardboard edge), and if it is dirty, just replace it. Don't attempt to clean it. Some higher efficiency 1" pleated air filters can go up to three months before needing replacement. But in the higher-use seasons, it's better to check more often. How long does it normally take to install a system? Depending on the scope of the work it can take from 4 hours to a week. - Is it making strange noises? - Is it cooling or heating all areas of your home sufficiently? - Has it been taking longer to cool down or heat up? - Have your utility bills been rising for no apparent reason? Any of these are signs that you may have a problem that needs service. In most cases, the longer you delay, the worse any underlying problems will get. So be sure to Call us at 1 877 678-2703 to check out your system whenever you notice anything out of the ordinary.